As part of its commitment to supporting employers in their efforts to create healthy, thriving workplaces, Kent Employment Law introduced its Employer Forum series, an in-house resource for forward-thinking business owners and HR professionals. 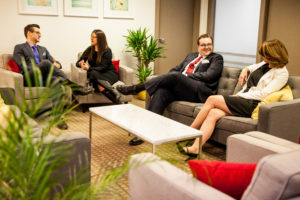 Offered in both Vancouver and Kelowna, these breakfast events are an opportunity for employers to learn from the experts and connect with their peers on topics ranging from hiring to firing. Our most recent Kelowna Forum took place on November 2, 2017 and explored issues relating to disability and workplace accommodation. David Brown mediated the conversation with local HR leaders Ashley Russo, Risk & Compliance Coordinator at the YMCA of Okanagan, and Diversified Rehabilitation Group’s Derek Sienko and Kasia Rynkowski. This casual conversation brought forward outstanding contributions from the perspectives of human resources, the law and plain-speaking business practicalities. An employee on disability leave is still your employee. While there may be sensitivities with respect to the nature of an employee’s health concerns, engaging the employee by asking how they are faring, seeking their input on how to communicate with clients/coworkers and reinforcing their value to the organization is crucial in maintaining engagement and encouraging the employee’s safe return to work. Employers need to be active participants in the process. Even where a third party disability insurer is involved, employers should be proactive in seeking employee status updates, including the scope of any limitations, and in designing and implementing return-to-work plans. Employers should seriously consider modified duties and gradual returns to work. Remarkably, if an employee is off work for three months or longer, there is a 50% chance they will never return to work. This percentage jumps to 95% when the employee has been off work for 12 months or longer! Recognizing these incredible statistics, employers should be active in engaging disabled employees, maintaining a healthy relationship with them and encouraging some form of return-to-work, even if it means significantly modifying their job duties. It is truly in everyone’s best interest. Our next Kelowna Employer’s Forum is scheduled for February 2018, when we will be talking about how HR managers and businesses should be preparing themselves for the legalization of marijuana and the effects on the workplace. And for Vancouverites wanting to join us in the future, our next Forum will be happening in January 2018. Keep your eye on our Events page for full details!